Add The Feed For This Gallery To Your RSS Reader: Click Here. The example archives on this page are designed using the AWSOM Pixgallery plugin version 4.6.X. 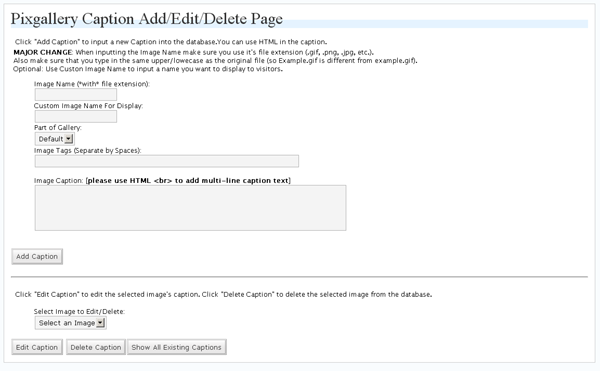 The original Pixgallery plugin was written by Nathan Moinvaziri of nathanm.com. The AWSOM version is a collaboration between Mr. Moinvaziri and myself. Easily Get Your Work Seen: With the New Image/Gallery RSS system you can let people always know when you’ve added new images to any gallery. With the new integrated ShareThis functionality people can easily share links to any of your galleries or images with their friends or the world. Easily Installed: AWSOM Pixgallery requires no theme editing and creates all tables, cache folders and default gallery folders for you with a single activation click on your plugin admin page. Drop and Go functionality: Upload your images into a folder on your server, put a code in a post or page (which Pixgallery can generate for you), and immediately have an automatically created gallery with thumbnails, watermarks, news post interlinks (when used with the Comicpress theme system) pagination and more in seconds. Easily Updated: Adding or removing images is as simple as adding them to the original folder–Pixgallery detects the new or changed images and adds them into your gallery with no work on your part. You can even add entire new folders of images just as easily by uploading them. Easily Add Metadata: Click on the link under any image (when logged into your site) and immediately go to a page to input custom names, tags, links, etc.–all using the New Advanced Visual Editor or code view editor. Now you can also display Photo EXIF data and IPTC data automatically. You can even optionally update metadata for your images directly through the thumbnail view! Easily present the images the way you want: Pixgallery can show your images in alphabetical order, the order they were added to the gallery, by numerical sort or the reverse of any of these types. Also add CSS options directly through the admin interface to theme your gallery to more closely match your website theme, or to show off your gallery in a special way. Show off your best work: Use the Custom Gallery Image system to have any image you want represent the folder icon for a gallery. Show Review Galleries like the Big Guys: Pixgallery can limit the thumbnails of galleries in your posts to a set number, with a “click to see more” link beneath, just like all of the major review sites–you can also choose to show names and captions with the images or simply present the images by themselves. Full Control over Image sizes and display: You choose the thumbnail size and Pixgallery creates them for you. You can even limit the “full size” images to match your theme’s width–All With the expected range of pop up window, open in new window, or “lightbox” new layer effects to display the actual full sized image. You can even set to automatically have Pixgallery hide your sidebar area to show more of your images in your gallery. Get Quick Feedback:You can optionally turn on the Individual Feedback system to have all comments placed on a gallery page or post “sticky” to the image or folder they were entered against, this sytem integrates directly with WordPress’s own comment system so all of your regular comment addons work with it, and all of your protections still work to keep your galleries spam free. And Yes, it works with the new WordPress 2.7 Nested comment system! And many more features, with active and fulltime development ongoing. 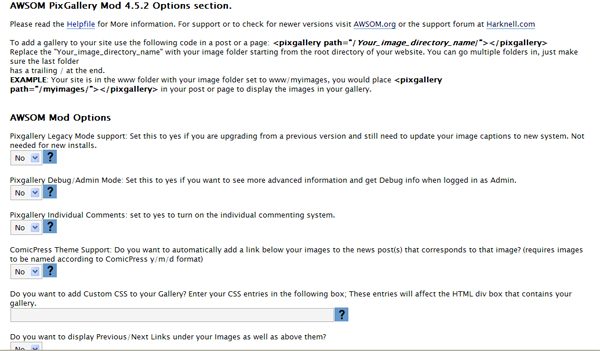 Your feedback has added directly to the feature set of AWSOM Pixgallery and is taken seriously. We want Pixgallery to be the easiest and best solution to adding an Image, webcomic, or photo gallery to your WordPress install. Hey, first time user of the plug in, Wanted to know how to make all the pictures get closer together. They have to much space between them? Can not find a adjustment? Hi, You have a few options. If you open the file pixgallery.css in the plugin directory you could play around with the entries to get more of the spacing you want. Alternately you could add more images per row, or adjust the size of the thumbnails. I just did a search of the WP plugins for “awesom pixGallery” but is doesn’t show up any more. What’s the deal??? hi,i set to yes to turn on the individual commenting system,but i want to comments shown on a same page too.Could u teach me how to do? Sorry my english is very poor, i hope u can follow me. Are you asking to have the individual comment system active, but also have all of the image/gallery comments also show up on one page as well? Currently there’s no way to do that within the plugin. I’m not really sure how that would actually work out. Would you want all of the comments to be on the top level gallery page? They wouldn’t make that much sense to people though, and obviously people couldn’t comment directly on the main gallery page. Thank you four your reply.I just want to display like picasa:http://picasaweb.google.com/JesseSimmers.Anyway,thx for the great plugin. hi,if i just display comment textbox and individual comment on img pages,and show all comments on one gallery page,how can i do? interested with your plugin. can it be configure to show my foodies in a page like tastespotting or notcot? thanks. I’m not sure exactly what you are asking. Do you mean in a gird fashion? Or do you mean submitted photos? There’s no upload function in the plugin to allow people to upload photos. But you could drop them into a folder and they’ll show up. You can play around with the CSS file for the plugin to make it look anyway you want it to. Shows up, even though I put right under it, but the /fanart/ doesn’t show up. Hi, if you mean you want three separate gallery codes to work on one page, that doesn’t work in pixgallery. 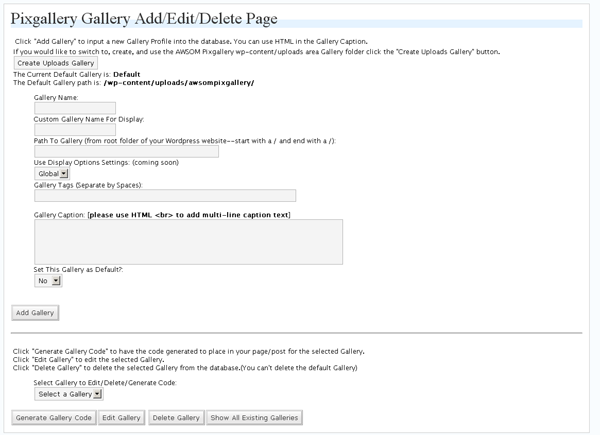 If you want three separate gallery folders to appear, which the user can then click to go to each specific gallery, then all that requires is placing the pixgallery code directed to the folder that all three are within. Ok, so if I put all three galleries in folders inside a folder (IE:/galleries/ had 3 folders in it, Gallery, fanart and whatever) I would point the code to /galleries/? Damn, nope. Now I just have file folders. In previews it seemed to work but now it’s just showing the directories. Usually if the preview works but the actual page doesn’t, you might be having a plugin or other conflict. Do you have a link to the page so I can see what it looks like? I fixed it. I had to turn on Absolute links or whatever it was called. Sorry for the trouble. Hi. I can’t get Lightbox working. It’s just opening the large image inline. I’ve tried the option to open in a new floating window as well, but that’s not working – just opening inline in the same page, as if I had all js disabled. I tried using the Fancybox plug-in instead and disabling all js in PixGallery, but that won’t work either. Do you have any ideas? Presumably there’s a js conflict somewhere, but disabling all other js except swfobject still doesn’t solve the problem. Hi, Please try the standard set of checks to see if things are conflicting. First try using the WordPress default theme. Then turn off all other plugins and try. Once you know what’s causing the issue it can be solved. You can also totally drop out the pixgallery js file by renaming or deleting it from the server. well, i guess you can check how they find the difference in other WP plgunis in this issue about the settings: i guess there are many browsers ans OS that you didn’t added to this plugin. maybe you can add an option to the user to add by himself agents, and maybe you can even make the plugin to send what the users added to a main DB, so he will share his knowledge with tall the plgunis users Dor. In an effort to streamline work flow, is it possible to integrate pixgallery directories into the standard WordPress media tool to allow multiple postings of portfolio images in other parts of the site? Hi there, everything but the automated thumbnail generating seems to work brilliantly – I only get a “?”, and a clickable name (which, when clicked, oddly enough opens the original image, so it must be the thumbnailing that fails). Any suggestions? Generally the issue of Thumbnails not appearing has to do with the path to the cache folder being set wrong in the settings area. Your server may require a forward slash / in front of the path to the cache folder. Try that first. Sweet, now I see thumbs and everything. BUT when I click the thumbs, the image scales beyond the values I entered under “Gallery Images”. In fact, no matter what values I enter, it enlarges to the documents orignal size, and doesn’t respect the values in pixgallery settings. Hi, are you using the lightbox to display the images? Or does it go to the single image view page? There are different values depending on if it’s lightbox, intermediate thumb, or full size image. This is especially true if you are using a 3rd party lightbox plugin. Installed your plugin and now my site has slowed to a crawl. Deactivate your plugin and site works fine again…any ideas? I really like this plugin and would like to figure out what’s going on. Most of the time this slow down is caused by a php timeout issue. What this means is the plugin script is not allowed access to some of the images on your site, and is waiting for the timeout to occur to stop bothering trying to do something. Typically this is due to injected image advertising that appears within a post or part of your page. Pixgallery is trying to look at that image to see if it needs to be resized, but since the image isn’t on your server (it’s on the advertising server somewhere) it is failing and waiting for the timeout to occur. I don’t really have a fix I can provide right now for this issue. The design of the plugin by the original developer has this as a core issue, so it’s a bit of a difficult fix for me at this point. I guess maybe a different gallery plugin might be a better fit for you at this point. Ya, I have hundreds of images from photobucket and some from various other places. Do you know of any other plugins that follow the same concept as this one (allowing galleries from folders already on the server)? Unfortunately it’s not that simple. The way the plugin works is built around the scanning for images. I’ve been searching for a way around this for awhile but haven’t found the key to it yet. I have looked at a bunch of plugins and I can’t find any similar to this one. Do you know of any? I really like this plug-in but I don’t like that a comment made on a gallery appears on EVERY photo and gallery. Is there a way to make the comments stick only to the specific photo or gallery? Paul did you find any other options? There’s actually a setting for that. It’s called Individual comment system, and it’s in the Pixgallery admin page. Turn it on and any comment added on the gallery or image view pages sticks to only that image or gallery view. Thank you VERY much. That fixed my problem. I love Awsom-Pixgallery again. I don’t know how I missed that one. I usually play with every option. thanks for the demo. I am going to try it. I am new to wordpress so thanks for the help. How to get Single Image permalink? Like, whenever someone open Gallery and select any Image, when the page will open it will display the selected image but I want to display its permalink too. So tell me what code should I add in my single.php so that it will generate permalink of that image? I have another problem, I changed the links from =23.php type ones to /10/11/page/, but now all my icons in the pixgallery aren’t showing up. The Admin setting “Use Absolute Linking” generally fixes this issue. Try that out and see if it works for you. Hello! Thanks for creating this great gallery. I’ve almost got it working, but I’m having one problem so far. When I try to order each sub-gallery, the number ordering does not seem to actually do anything. They are clearly ordered by number (using the Manage Gallery part in the wp-admin), but when it displays on the front end, it doesn’t actually order them as they should be. Am I missing something? Thanks! Scratch my last question. I figured it out. I missed the pull-down at the top of the options that has “Ascending Numerical Sort”. Thanks! Thank you. I checked into Flattr, and for the moment I don’t think I can set that up. One thing to note is they use Paypal, so every amount donated to a person using Flattr is actually reducing your donation amount twice as both systems take a cut. I understand that it’s not optimal to use multiple systems to support things you like, but I would suggest considering directly donating to AWSOM.org (or others) through the Paypal donate button on the site if that option is available. Regardless, thank you for the statement of support, it’s appreciated. Fixed my issue with the broken thumbnail links. It was a permissions problem. I switched permissions for my wp-content/uploads/cache directory to 777. Love the plugin. Any chance you will be able to turn it into a widget for WP3.1? I host events and would love to be able to show the guest speakers in a widget similar to the link I provided. It soulds like you have most of the work done. Thanks. I’m not sure when I’d have time to develop it as a widget. There are a few other plugins that add the capability to display images from a folder–so they might integrate with Pixgallery well. Thank you for catching that. I updated the page. Seems like the plugin am looking for, but pls will there be further updates on this plugin? It hasn’t been updated since june last year. I generally come out with updates if I get time to add a few new features. Also if a security or compatibility issue pops up. My time has become more limited so it’s harder to do extensive additions. I use the plugin on many sites and so it will never get dropped from support. very nice plugin thank you. any one know how to remove border of awsom pxgallery???? 1) A file called pixgallery.css in the plugin folder. If you edit this file it will change the look of things. 2) Your theme css file. I have problem with image path in my gallery. My image path is http://iphone-accessories-blog.com/iphone-wallpapers/?px=%2FiPhoneBG12.jpg i don’t wont to have ?px=%2FiPhoneBG12.jpg and speciali this ?px=%2F, because when i try to share link in tweeter or face book it’s share only gallery not the image. I hope that you can help me. Thank you! Unfortunately PixGallery needs that code to determine which image in the gallery you’d like to display. Due to the way WordPress does it’s fancy permalinks it would get difficult to switch to a different system without things getting confused. I’m always trying to figure out new ways to handle this but for the moment there isn’t one. Great plugin, it would be nice if the photos could be automatically rotated to the correct orientation as per the exif data?